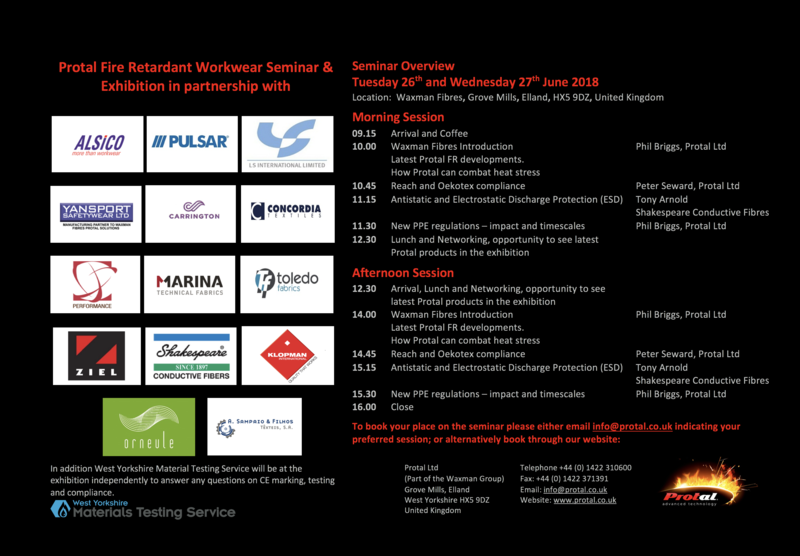 In June 2018 Waxman Fibres Ltd will hold their third Protal workwear seminar & exhibition for flame retardant workwear and multi-hazard protection highlighting the dangers of arc flash, flash fire and how Protal garments offer protection against such risks. Protal partnership exhibition – your opportunity to meet fabric and garments makers, see the latest products. All seminars will take place at Waxman Headquarters, Grove Mills, Elland, West Yorkshire. Seminars are completely free of charge. On Tuesday 26th June we will be holding an evening reception at the Briar Court Hotel. All of our seminar places are now fully booked. However, there may still be places available dependent on group size. Please contact us on info@protal.co.uk if you are interested in attending.